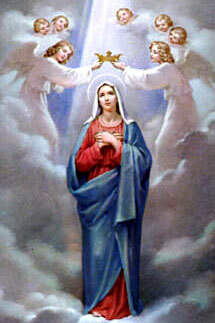 The Easter prayer Regina Coeli (“Queen of Heaven” in Latin) is a wonderful tribute to our Lord’s resurrection and to the Blessed Virgin Mary (pictured in her Coronation at left). Although its origins are unknown, it dates back to the 13th century. The Regina Coeli is one of four antiphons (short liturgical texts sung or chanted, often as seen below, in a responsorial pattern) dedicated to Our Lady. It is often sung as a hymn and has had numerous musical settings in its original Latin text, including several by Mozart. Traditionally, it is prayed standing, often at noon, in place of another well-known prayer, the Angelus, during the Easter Season from Holy Saturday until Pentecost.